Goldfinger Law concentrates in assisting clients with their spinal cord injuries. We have devoted a significant amount of resources towards advancing the needs of our clients. We are known in the personal injury community for achieving optimal results in spinal cord injury cases. We have won multi-million dollar awards and settlements for our clients both inside and outside of the courtroom settling. We have given our clients the peace of mind, financial stability and long term health care support they need to restore dignity to their lives so they can put the terrible accident behind them. Goldfinger Law will handle your case with the degree of caring, compassion, empathy and understanding necessary for these complicated cases. 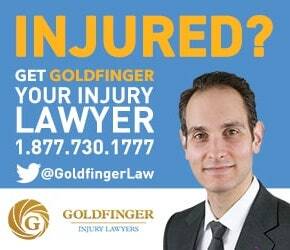 Time and time again, accident victims, doctors, health care professionals, families and even other lawyers are turning to Goldfinger Law as their most trusted source for legal support in these types of cases. Spinal cord injury can occur in a variety of ways. Car accidents, motorcycle accidents, pedestrian collisions, boating accidents or bicycle accidents have all been known to cause spinal cord injury. Because spinal cord injury is so serious, and so complex, Goldfinger Law works closely with a top notch team of medical professionals to better advance your case. Goldfinger Law works with the best doctors, surgeons, neurologists, physiotherapists, occupational therapists, social workers, psychologists and speech language pathologists to help you on your road to recovery. We know that your case and your journey back to health will be demanding. We know that it will take a multi-disciplinary approach to get the best results for you. This is why we only surround our self and our clients with the best treatment team possible. We will be there every step of the way to make sure that you have the information you need, the attention you require along with the care you deserve to get you back to health. Your health and your well being is our top priority. The personal injury lawyers of Goldfinger Law understand that it’s just not the physical which gets affected by a traumatic spinal cord injury accident. It’s also the emotional and cognitive which are affected as well. Goldfinger Law will provide you with access to the best treating psychologists, psychiatrists, therapists, social workers and counsellors around to help you and family get through these tough times. We also know that it’s not just the immediate accident victim that suffers as a result of a traumatic spinal cord injury. It’s also the family, spouse, siblings, friends and loved ones who suffer as well. Goldfinger Law will ensure that your support system is well taken care of and educated to better cope with the dramatic change which may follow a traumatic spinal cord injury. If you or a loved one has been involved in an accident which has resulted in spinal cord injury, call Goldfinger Law today for your free one on one consultation with one of our lawyers. There is no obligation, and all of our consultations are conducted in the strictest confidence. We service clients across Ontario, with offices in Toronto, London and Peterborough. If you are took hurt or not in any shape to visit us at one of our offices, we will come and see you. Our lawyers conduct both home and hospital visits across Ontario free of charge.